Kamloops is a city in south central British Columbia in Canada, located at the confluence of the two branches of the Thompson River near Kamloops Lake. It is the largest community in the Thompson-Nicola Regional District and the location of the regional district's offices. The surrounding region is more commonly referred to as the Thompson Country. It is ranked 37th on the list of the 100 largest metropolitan areas in Canada and represents the 44th largest census agglomeration nationwide, with 85,678 residents in 2011. Prior to the arrival of European settlers, The Cree-Saulteaux band led by Chief Yawassannay had migrated to this region in the early 15th century where they met the local Secwepemc (Shuswap) nation (part of the Interior Salish language group). The Yawassanay band's Kamloops settlement was the largest of their three tribal areas. The first European explorers arrived in 1811, in the person of David Stuart, sent out from Fort Astoria, then still a Pacific Fur Company post, and who spent a winter there with the Secwepemc people, with Alexander Ross establishing a post there in May 1812 - "Fort Cumcloups". The rival North West Company established another post - Fort Shuswap - nearby in the same year. The two operations were merged in 1813 when the North West Company officials in the region bought out the operations of the Pacific Fur Company. After the North West Company's forced merger with the Hudson's Bay Company in 1821, the post became known commonly as Thompson's River Post, or Fort Thompson, which over time became known as Fort Kamloops. The post's journals, kept by its Chief Traders, document a series of inter-Indian wars and personalities for the period and also give much insight to the goings-on of the fur companies and their personnel throughout the entire Pacific slope. Soon after the forts were founded, the main local village of the Secwepemc, then headed by a chief named Kwa'lila, was moved close to the trading post in order to control access to its trade, as well as for prestige and protection. 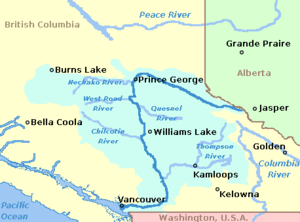 With Kwalila's death, the local chieftaincy was passed to his nephew and foster-son Chief Nicola, who led an alliance of Okanagan and Nlaka'pamux people in the plateau country to the south around Stump, Nicola and Douglas Lakes. Relations between Nicola and the fur traders were often tense but in the end Nicola was recognised as a great help to the influx of whites during the gold rush, though admonishing those who had been in parties waging violence and looting on the Okanagan Trail, which led from American territory to the Fraser goldfields. Throughout, Kamloops was an important way station on the route of the Hudson's Bay Brigade Trail, which originally connected Fort Astoria with Fort Alexandria and the other forts in New Caledonia to the north (today's Omineca Country, roughly), and which continued in heavy use through the onset of the Cariboo Gold Rush as the main route to the new goldfields around what was to become Barkerville. 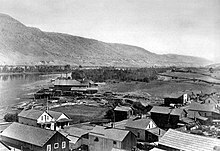 The gold rush of the 1860s and the construction of the Canadian Pacific Railway in the 1880s brought further growth, resulting in the City of Kamloops being incorporated in 1893 with a population of about 500. The logging industry of the 1970s brought many Indo-Canadians into the Kamloops area, mostly from the Punjab region of India. In 1973, Kamloops annexed Barnhartvale and other nearby communities. Industries in the Kamloops area include primary resource processing such as Domtar Kamloops Pulp Mill, Tolko-Heffley Creek Plywood and Veneer, Lafarge Cement, Highland Valley Copper Mine (in Logan Lake), and others. RIH (Royal Inland Hospital) is the city's largest employer. TRU (Thompson Rivers University) serves a student body of 10,000 including a diverse international contingent. Thompson Rivers University, Open Learning (TRU-OL) is the biggest distance education provider in British Columbia and one of the biggest in Canada. Kamloops is home to many galleries including nationally recognized Kamloops Art Gallery, the Kamloops Symphony Orchestra, Western Canada Theatre, the British Columbia Wildlife Park, the Kamloops Heritage Railway, Kenna Cartwright Park and Riverside Park. Kamloops is also well known for its public art including numerous pole carvings and murals. Kamloops is situated in the Thompson Valley and the Montane Cordillera Ecozone. The central core of the city is located in the valley near the confluence of the north and south branches of the Thompson River. Suburbs stretch for more than a dozen kilometres along both north and south branches, as well as to the steep hillsides along the south portion of the city and lower northeast hill sides. Kamloops Indian Band areas begin just to the northeast of the downtown core but are not located within the city limits. As a result of this placement, it is necessary to leave Kamloops' city limits and pass through the band lands before re-entering the city limits to access the communities of Rayleigh and Heffley Creek. Kamloops is surrounded by the smaller communities of Cherry Creek, Pritchard, Savona, Scotch Creek, Adams Lake, Chase, Paul Lake, Pinantan and various others. Canadian National trains pull through North Kamloops then cross this rail bridge over the North Thompson River to the Kamloops Indian Reserve, and CN's large rail yards. The climate of Kamloops is semi-arid (Köppen climate classification BSk) due to its rain shadow location. Because of milder winters and aridity, the area west of Kamloops in the lower Thompson River valley falls within Köppen climate classification BWk climate. Kamloops gets short cold snaps where temperatures can drop to around −20 °C (−4 °F) when Arctic air manages to cross the Rockies and Columbia Mountains into the Interior. The January mean temperature is −2.8 °C (27 °F). That average sharply increases with an average maximum temperature of 4.3 °C (40 °F) in February. The average number of cold days below −10 °C (14 °F) per year is 19.9 as recorded by Environment Canada. Although Kamloops is located above 50° north latitude, summers are warm to hot with prevailing dry, and sunny weather. Daytime humidity is generally low (sometimes less than 20% after a dry spell) which allows for substantial nighttime cooling. Occasional summer thunderstorms can create dry-lightning conditions, sometimes igniting forest fires which the area is prone to. Spring and Fall are usually pleasant and dry but can be short in duration. Kamloops lies in the rain shadow leeward of the Coast Mountains and is biogeographically connected to similar semi-desert areas in the Okanagan region, and a much larger area covering the central/eastern portions of Washington, Oregon and intermontane areas of Nevada, Utah and Idaho in the US. These areas of relatively similar climate have many distinctive native plants and animals in common, such as Ponderosa Pine (Pinus ponderosa), big sagebrush (Artemisia tridentata), prickly pear cactus (Opuntia fragilis in this case), rattlesnakes (Crotalus viridis), Black widow spiders and Lewis's Woodpecker. The hottest temperature ever recorded at the airport, 40.7 °C (105 °F), occurred on 13 July 2014; the hottest reliably accurate temperature ever recorded within the city, 41.7 °C (107 °F), occurred first on 27 July 1939 and again two years later on 16 July 1941. Elections into the municipality in Kamloops are held with the rest of the province every three years. Provincially, Kamloops is considered to be bellwether, having voted for the governing party in every provincial election since the introduction of parties to British Columbian elections. By contrast, Kamloops has regularly voted against the party in power federally until the 2006 Federal election. Kamloops is represented in two provincial ridings – Kamloops and Kamloops-North Thompson – and one federal riding – Kamloops—Thompson—Cariboo.